Jaguar designed a V12 engine on paper back in 1954, but no hardware was produced during those early years. The V12 sat on Jaguar’s drawing board until Le Mans fever ran through the company in the early 1960s. For those interested in saving money, Used Jaguar V12 Engines for Sale are available at Usedenginesforsale.com now. Jaguar wanted a piece of Le Mans. Jag needed a racing engine that could show Jaguar enthusiasts around the world that the XJ13 could hold its own against these racing giants. Unfortunately the XJ13 was somewhat obsolete when it wheels hit the pavement. The power output didn’t compare with Ford’s push rod V8s. The suspension design and the chassis of the car were aerodynamically inferior as well so the project quietly was put on ice in 1967; thoughts about conquering Ford’s dominance melted away. When the V12 engine was actually built, the cylinder heads were clones of the XK. The inlet ports were shifted to a downdraft position between the camshafts. The 5.3 liter engine was still not ready for production until the redesigned engine had a 2-valve SOHC design that could reduce the complexity, noise, and weight of the old engine design. The engine finally went into production in 1971 in the Jaguar series III E-type. The 5.3 version had a 3.5 inch bore and a 2.5 inch stroke. The engine produced 242 horsepower, 282 horsepower, or 295 horsepower depending on the compression ratio and emission controls. The V12 had the Lucas Opus electronic system in place until 1982. That’s when the Lucas CEI system was introduced. The Lucas ignition amplifier cause overheating issues until it was mover away from the engine. The High-swirl design “May” cylinder heads were used in the 5.3 liter HE. The engine had an unusually high compression ratio of 10.5:1 to 12.5:1 depending on the model and year. This engine design was a fuel efficient beauty since fuel economy increased by 50%. The May head design did have some serious issues. Tuning the engine was one of those issues, plus the chamber design created frequent engine failure, and that was another annoying issue. But, the 5.3 HE was used from 1981 to 1992 in the XJS and the XJ12. The 6.0 Liter HE was introduced in 1992 and it was used in the XJS until 1995. The XJ12 used the 6.0 liter engine until 1997. 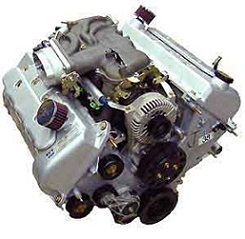 Usedengines.com has more information about V12 engines and we will sell you one. Call or email us now. Every used engine has a peace of mind warranty too. Ask about it.